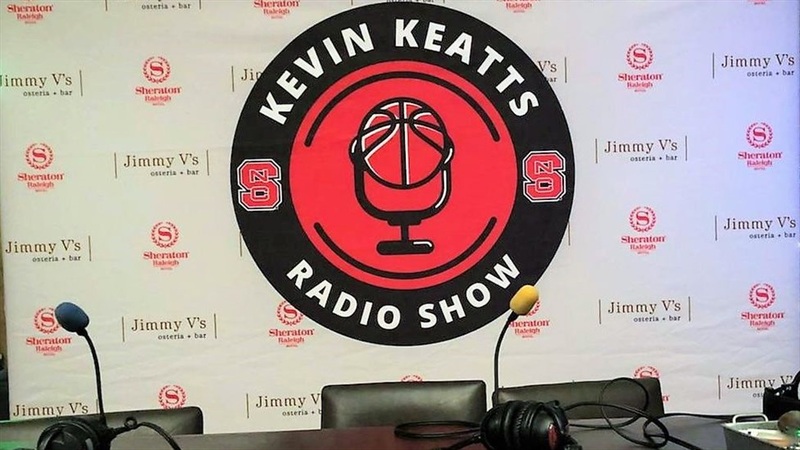 NC State head coach Kevin Keatts held his weekly radio show earlier this week at Jimmy V's Oyster Bar. Here are some of his notable comments from the show. We learned a lot. We learned how to we play with the lead and then we learned obviously how to lose a lead. 1-1 in a week... I would love to be 2-0, but I've always told those guys if we lose a game and we learn from it, I’m okay with it. I don’t want them to get used to it, but we learned a lot. We did some things in the Vanderbilt game, too. I’m a fan of neutral site games. I think if you can win at a neutral site you can win anywhere. At home, you have the crowd and then going on the road and winning is a big deal in an environment. Neither team has an advantage at a neutral site, so we had to create our own excitement. You have to cheer for each other. As a coach, everytime I yell you can hear it, which is great. Time and score. At the end of the game, Markell Johnson controlled the tempo against Vanderbilt that didn’t give them a chance to come back. Because we are young, meaning playing together, against Wisconsin we didn’t handle every situation great. Markell made plays and ran clock against Vanderbilt. Against Mercer, with 56 seconds left, we had 20 seconds on the shot clock and took a quick shot. These are things you talk about in practice but until you experience it in a game, you can’t go back and talk about it on film. He filled the stat sheet. He had the ball in his hand the majority of the night and had two assists and only two turnovers. He shot 70% and rebounded the basketball. All that said, I was most impressed with the fact that when we needed a basket he got us one and when we needed to slow it down and get a good shot, he did that, too. I think they bring something unique to our team. Walker and Funderburk are totally different so you have to prepare for two completely different bigs. Both of them do some good things for our team. I’ve challenged each guy to help us rebound because we aren’t the biggest team. You have to have the desire to rebound and our guys are doing a good job. We tell them all to rebound and they’re doing a good job. We had 17 offensive rebounds against Vanderbilt which is good. We want to play inside and out and we give them freedom to take threes, but I want them to get to the rim and [get] paint touches. When you play a zone you expect to take a lot of threes, but fortunately for us we didn’t. It takes some guys longer than others. His games will come. He’ll have a breakout game and you’ll realize how good he is and going to be. It takes every player a different amount of time. CJ Bryce didn’t play well in the scrimmages. Devon had a great exhibition. These guys haven’t played competitively in over a year and sometimes it takes them a little longer. He played with energy. Games before he wasn’t playing with as much energy. Early on, he played with a lot of energy and he hadn’t had that recently. He came out with energy and was the reason we played [well and] got an early lead. I was impressed with our guys to score 80 points and only two in the fast break. Everybody knows we want to get out in the fast break, but we are capable of scoring in different ways with defense or in the halfcourt. I was happy with the halfcourt execution. There’s more fouls on us because we’re out in the open court. That doesn’t mean a halfcourt team doesn’t foul as much, but there’s so much congestion you don’t always get the call. In the open court it puts the referees in a tough spot because everybody can see it. A halfcourt team has more congestion and they may foul you on every possession, but it’s harder to see for a referee. Wisconsin takes the best charges I’ve ever seen. He does a tremendous job and I’m going to try to come up this summer and figure out how they do that. They took five charges on us and it is what it is. It doesn’t concern me. It’ll even itself out over time. It’s not a witch hunt for me to say anybody’s out to get me. Referees are human; they’re very good, but some of them make mistakes and I respect that. We’ll score in other ways. When I think about Jim Valvano I think about everything he’s done for cancer research. Every time you hear the speech it’s like the first time you’ve heard it. It’s one of the most powerful speeches I’ve ever heard. It means so much and he spoke from the heart. Anytime we can donate money for cancer research it means so much. I’m excited for Wednesday because of the game and because of the significance of the night. It’s a special occasion. You make a mistake if you look at the record. They just took Furman to double overtime and Furman is ranked. They lost to Wake Forest by seven points. They’re a very good team.